Yep, this hike was unique! Spoiler alert: this was one of the coolest and most unique hikes I've done. Last week, I covered a stunning high above treeline hike in Slovakia's High Tatra mountains after having recently returned from a trip there. 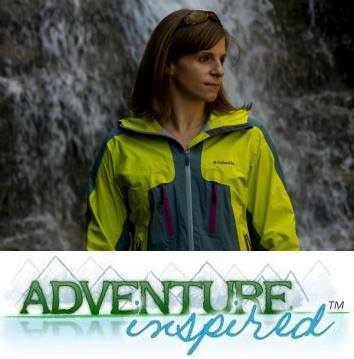 An incredible, generous, adventurous friend grew up in Slovakia, which meant those of us on the trip benefited from her extensive knowledge of the places we visited. Before we left, she sent me an article detailing the top six hikes in one of the country's national parks - Slovenský Raj. The direct translation? Slovak Paradise. I didn't initially believe the translation, thinking it was perhaps just a nickname. But it's true. And after a visit there, I can understand why. Slovenský Raj is actually a plateau, and part of the Low Tatra mountains in eastern Slovakia. It first became a protected parcel of land in the early 1960's, then a national park in the late 1980's. Steep canyons, deep gorges, tall cliffs, and towering waterfalls make for some spectacular scenery and endless opportunities for adventure. 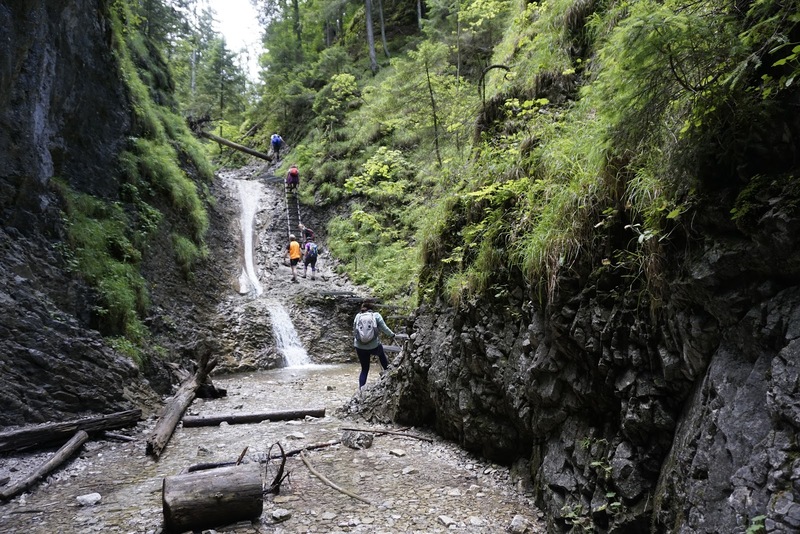 We had more hiking options than we had time for on our trip, and choosing one was a challenge. In the end, Suchá Belá won out, and boy am I glad it did. The parking lot we used to access Suchá Belá is located in Podlesok in the Spišská Nová Ves district. It was a short 15 minute drive from our (absolutely gorgeous) accommodations in Arnutovce, and we paid a few Euros per car to park. It was another few Euros to enter Slovenský Raj, and from Podlesok, we followed a paved road to the start of the trail. Signage was clear and easy to spot, and one of the first signs we saw reminded us the route is one way. Once we started, there was no turning back, and given the route, its completely obvious why that is. The start of the hike looked relatively tame - a dirt path along a creek wide enough for two people to walk side by side. A few minutes into the hike, following green blazes, that all completely changed. We found ourselves walking straight up and through a creek with walls of trees and deep green foliage on either side. The trail wound back up on to the banks of the creek in some spots, but I was glad to have packed and worn a pair of waterproof boots. One of the first unique things I noticed about this hike was that the trail went right up the center of the creek! As we continued up, the canyon walls seemed to get taller and taller, giving us fewer opportunities to walk on dry land. 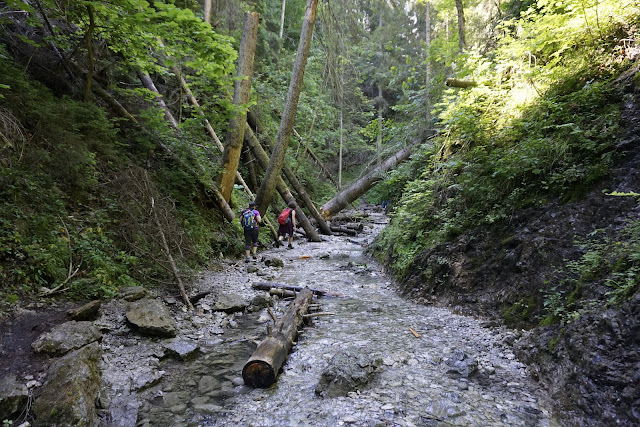 We rock hopped, balanced on fallen logs, or just walked straight through the water. About 30 minutes into the hike, man-made structures and fixtures started to appear in an effort to allow us to gain forward and upward progress. 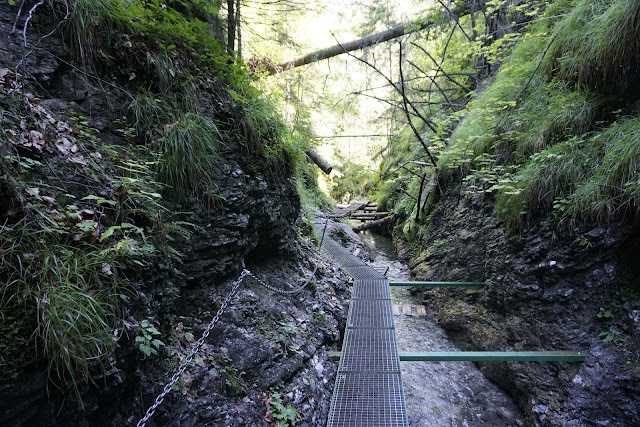 Steel grated walkways with chains bolted to the gorge walls. 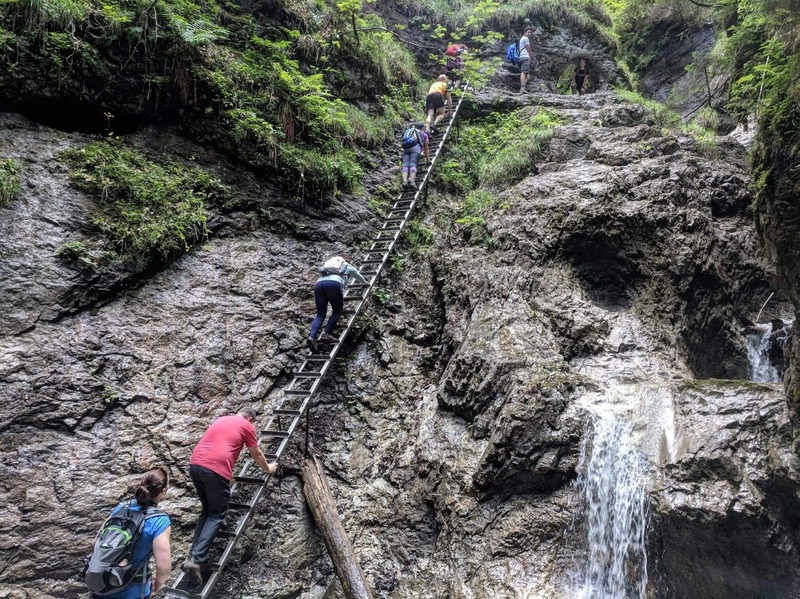 I'd read about the wooden planked walkways, steel grates, ladders, and chains while preparing for the hike, but seeing them on the route was an entirely different story. The wooden walkways and flat steel grates weren't intimidating to cross, just unique aids I'd never seen on a hike before. As we continued up, we switched between walking up through the creek and walking on the artificial aids. An hour and 15 minutes into the hike, things started to look completely different. The canyon walls shot up into the sky, narrowed, and around a corner, a giant steel ladder came into view. Given I'm not a fan of heights, especially climbing up artificial structures unprotected, I knew this part of the route was going to be a bit tricky. I'd seen this ladder in photos of the hike, and when our group made it to the top, I assumed that was the only ladder of that size on the route. I was wrong. More ladders and steel platforms! Eventually, the more of them we traversed, the less intimidating they felt. As I relaxed, I started to look around. The flora sprouting out of the canyon walls was so incredibly green. I listened to the sound of the water hitting the rocks, trickling down, which had become such a part of the day that I hardly noticed it anymore. I heard birds, and saw a few stray beer cans we picked up and carried out. By the time we arrived at the last ladder, I relaxed enough to turn around at the top and look down for photos of my friends. As we continued up, the route flattened, and eventually turned right heading up the shallower creek banks. Almost our entire crew nearing the top of the route. After an exciting ascent, it was almost disappointing to find ourselves on an otherwise normal looking trail, climbing up toward the hike's midpoint. After just under two hours, the trail stopped climbing, and we stopped at a picnic area at the top for lunch. We dumped trash we'd collected on the way up in a series of trash cans next to picnic tables, and I saw a vehicle towing a trailer of mountain bikes parked nearby. Turns out, we could've rented bikes to bike down if we needed to! The descent to the parking lot involved walking wide gravel roads and wooded trails in between bends in the roads, and we found ourselves back where we started about 30 minutes after starting the trip down. Round trip, the route took us 3.5 hours with breaks. 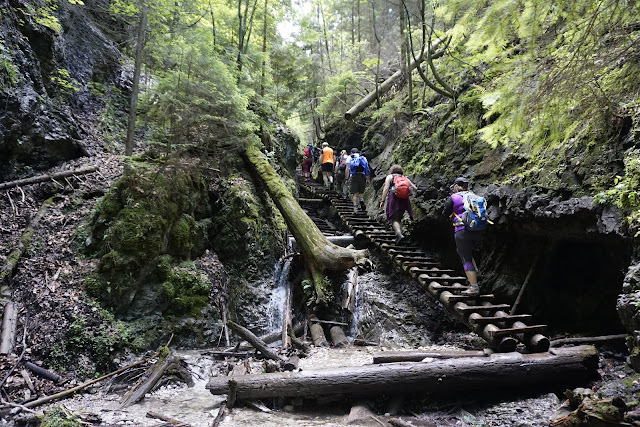 This hike is super popular, and with good reason. We were lucky to score a good parking spot, but the lot was completely full when we got back. Get there early, or try to go on a weekday. But aside from that, based on what I read and learned firsthand, the most important thing is to make sure you're wearing the right footwear. I almost didn't bring my waterproof boots, but given we basically walked up a stream, they sure came in handy. I didn't have to worry about getting my feet wet and tromped right through the water for most of the hike. The Vibram soles helped me feel steadier on my feet, which made a big difference on the ladders and wooden staircases. The next most important thing is to do the route in the right direction. We did two one-way hikes on the trip, and on both, it would've been a serious challenge and quite unsafe to run into other hikers going the wrong way in the wrong places. But you don't need a map, the trail is obvious and clearly marked. And finally, make sure you stop for pivo (beer in Czech, and Slovak) and snacks on the way out. There are a few beautiful spots to hang out outside and recover, like this one. Given this hike's popularity in Slovakia, I'd love to know if anyone's done it! If you haven't would you? Or have you done a hike like this?